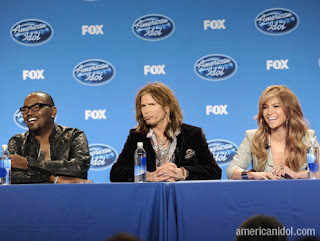 After the flurry of publicity surrounding Simon's exit, Ellen's amicable departure, Kara's pink card and the grand unveiling of new judges Steven Tyler and Jennifer Lopez, television juggernaut American Idol is finally taking the reins of its own publicity and has released promos for its upcoming 10th season. Watch the videos below (one :30 clip, one :60), and then let's talk. Very sweet, very inspirational, very "please forget how drab last season was and we promise to never mention Tim Urban again." I enjoy the :60 spot for it's look back at all of the previous winners, but when narrowed down to 30 seconds, I can't possibly be the only one thinking "How did Ruben Studdard sneak in?" right? I understand they only showcased winners, but can you just imagine if they expanded this campaign? Keep the :60 spot, but then do several :30 spots highlighting successful Idol alums, regardless of whether they won or not. Because as nice as it is to see Kris and Jordin, do we really want to remember Taylor "Soul Patrol" Hicks? I'd love to see promos that show the most successful alums, starting with their audition through their time on the show and then showing them in their post-Idol success. Kelly Clarkson singing "Natural Woman," then winning the show, then accepting her Grammy for "Since U Been Gone." Or Jennifer Hudson on the show and then accepting her Oscar for Dreamgirls. Clay Aiken on Broadway, Chris Daughtry on tour, Adam Lambert on the cover of Rolling Stone, Carrie Underwood being the unstoppable force that she is. Remind the audience that all these people started their illustrious careers because they went to an audition for a reality TV show. Oh and one last thing—they did an excellent job having Randy be the only visible judge in these promos. The less we are reminded of Simon's absence, the better. I miss him already.